This is something of a stock element in tales about people living with mental illness. Almost inevitably, it seems that mental illness in fiction gives people gifts or insights that other (so-called “normal”) people do not (and cannot) have. Winning the Best Picture Oscar, A Beautiful Mind is perhaps the biggest example in recent memory. Some of these stories are told well and some are not. However, related to that trope, there is a tendency to suggest that medicating or treating that illness diminishes the person; a cliché perhaps typified by One Flew Over the Cuckoo’s Nest. There is something beautiful and brilliant about this. This season has worked hard to suggest that kids don’t have to fit in to be special; kids don’t have to excel at school to be good people. Episodes like The Caretaker and Flatline has emphasised that it is possible for children to do great even as they struggle to fit within the social structures around them. Given that a large part of being a child (particularly a teenager) is feeling like the world is aligned against you, this is a lovely storytelling touch. There is a beautiful moment early in In the Forest of the Night when Maebh tries to talk to the Doctor about what it is like to be a child. “Everybody seems to know everything about everything apart from me,” she assures him. It’s a beautiful line rich with meaning in a way that childish dialogue often is. Does Maebh mean that everybody apart from her seems to know everything? Or does she mean that everybody understands everything but they don’t understand her? However, In the Forest of the Night hits a bit of a bump when it reveals that Maebh is suffering from a psychological illness. She hears voices that are not there; an experience that must be terrifying to a child. It must be terrifying to anybody. We are told that Maebh has been diagnosed and is receiving treatment for her condition. “She’s very vulnerable,” Clara tells the Doctor. “Apart from being almost savaged by a tiger and abducted by a Scotsman, she’s allowed any nervous tics she likes, okay?” Danny Pink advise the Doctor. However, the Doctor is immediately horrified to hear that she is on medication. In fact, the Doctor seems to get very upset at the idea of a child ever being placed on medication. “You people, you never learn,” he informs Clara. “If a child is speaking, listen to it.” He explains that the child’s illness is a result of the fact that “Maebh Arden is tuned to a different channel.” Being the title character in a family fantasy show, the Doctor gets to be entirely and completely correct in his assessment of the situation. It turns out that Maebh is not suffering from a mental illness, but is instead hearing the voices of magical trees that have arrived to protect the planet from a giant solar flare. Which is obviously not something that you’d like to medicate out of a child. “She can lead us to the source, to the heart of the forest,” the Doctor informs the people gathered around her. “We have to listen to her. We have to find her.” Maebh Arden is not a deeply troubled young girl who needs the help and support of the people around her; she is the messiah. However, there is something uncomfortable about this knee-jerk reaction from the Doctor. The audience is clearly meant to side with him. He is normally right about such things, and In the Forest of the Night is no exception. When Danny and Clara raise legitimate and responsible concerns about Maebh’s health – particularly when she seems to be in a something of a trace – the Doctor shoots them down and is almost immediately vindicated. Clara and Danny are just being close-minded; they are trying to bury a gift that makes them feel uncomfortable. Indeed, In the Forest of the Night works quite hard to justify this stance. It is suggested – and proven – that the Doctor knows more about Maebh than Clara or Danny, despite the fact that he has had a single conversation with her. The Doctor may not have any previous experience with Maebh or psychological training or even a perfect track record when dealing with kids, but he clearly knows what he is talking about. The show has come a long way from The Doctor, the Widow and the Wardrobe, when the psychic paper could not even vouch for his childcare skills. That’s a terrible thing to hear a teacher say, particularly given how hard the season has worked to make it clear that Clara is a good teacher. It might make sense for a teacher to say something like “they’re not gifted and talented in the way that you want them to be, or the way society wants them to be” or “they’re gifted and talented in a way that needs special attention and care.” However, Clara doesn’t say those things. She basically admits that she lies to children because it is the only way to make them feel good about themselves. That would be a horrible thing for a guest character to say. It is the kind of thing that Fenton might have said back in Flatline. It is a piece of dialogue that is generally followed by the warm feeling of satisfaction that the character who said it will be eaten by monsters. It is not a thing that a companion should say, and it is not a thing that a companion who has been identified by the Doctor as a “great teacher” should say. It is a piece of dialogue that exists to make it clear that the Doctor is on the right side of this argument. It’s lazy. 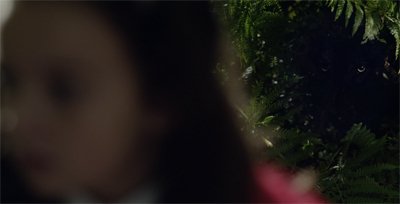 Indeed, In the Forest of the Night is an episode that does a lot to undermine the idea of Clara as a sympathetic character. It is probably the only episode of the season where the stock criticisms of Clara as a self-centred egomaniac hold up. 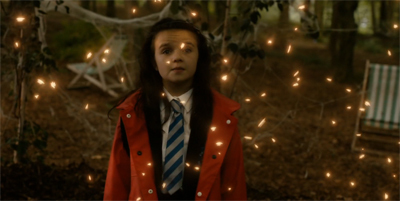 At the climax of In the Forest of the Night, Clara decides to let all the children in her care die, because they would probably just miss their parents if they survived or something. That would just be horrible. It is a much better alternative to have the kids miss their parents until they are burnt alive by a giant fireball. When the Doctor suggests that they are taking the kids, Clara responds, “Taking them where? What are you going do with them? Leave them on an asteroid? Find a space academy for the gifted and talented? They just want their mums and dads, and they’re never going to stop wanting them.” Clara never consults with the kids; never considers her own duty of care might extend to their safety might trump the fact they would feel sad at some point. Clara unilaterally decides that letting a bunch of children die is better than not letting a bunch of children die. However, that conversation is not quite finished with its ruthless character assassination. When the Doctor suggests that he might save Clara and Danny, Clara will hear none of it. “Danny Pink will never leave those kids so long as he is breathing,” she assures the Doctor. The implication is that Clara herself would be perfectly happy to abandon these children to their fates if she got to run off with Danny Pink. When the Doctor suggests taking Clara by herself, she states that she simply does not want to be the last of her kind. To be fair, it is a credit to how well the season has developed Clara that this feels out-of-character. Part of the problem with the character’s first half-season was that Clara was rather hazily defined, as the narrative tried to build up a mystery around her so that it could pull a clever subversion on the audience. The eighth season has built a world around Clara, one that adds considerable nuance and depth to the companion. In the Forest of the Night would still be a terrible episode had it arrived a year earlier, but Clara would not seem so out of character. Of course, Clara is not the only major character who seems a little out of sorts. The Doctor seems curiously accepting of the end of the world. When Clara asks him to save the world, he politely declines. “Stars implode. 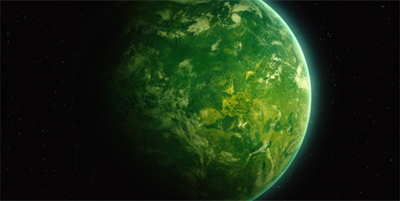 Planets grow cold. Catastrophe is the metabolism of the universe. I can fight monsters. I can’t fight physics.” This seems strange coming from a man who travels through time in a box that is bigger on the inside. One imagines that fighting physics is part of the job description. To be fair, In the Forest of the Night is using the same sort of story logic that surrounds the theory of “fixed points” in time. The script needs an arbitrary limit on the Doctor’s power, and a way to force him to stop trying to solve the problem. It just seems out of character that the Twelfth Doctor would find himself so resigned so quickly. As with the characterisation of Clara, it is clear that In the Forest of the Night is bending its central characters in order to have them fit the story that it wants to tell. Circling back around to the mental health issue, the idea that adults should listen to children is a good idea. It is something that not enough adults do; a lot of recent traumas involving generations of abused and victimised children might have been avoided if people listened. However, assuming that the only reason a child is on medication for a psychiatric condition is because nobody listened is a very harmful and simplistic idea. It judges parents of children who are medicated for legitimate conditions. It suggests to these children they don’t need medication. This idea that mental illness is a beautiful curse is a cliché. It appears across all forms of media. Mentally ill artists are frequently portrayed as tortured geniuses dealing with conditions that make them brilliant; if you remove or treat the condition, you somehow diminish the genius. It seems like In the Forest of the Night is embraces the cliché, with all the allusions to Blake. In the Forest of the Night seems to suggest Blake needed his hallucinations, and removing them would diminish him (and – by extension – us). The wolves hunting our heroes seem as likely to have escaped from a children’s book as from London Zoo. “Any minute now we’re going to find a gingerbread cottage with a cannibalistic witch inside,” Clara remarks. As the Doctor tries to figure out the problem, Clara advises him, “Not everything can be fixed by a sonic screwdriver. It’s not a magic wand.” But surely it’s close enough. In Time Heist, the Doctor worried he’d ended up with “magician.” In Flatline, he confronted “the boneless” like a Harry Potter character. Maybe “wizard” is more apt. There are points where In the Forest of the Night nods to particularly British tales of faerie folk. A little girl communes with what are obviously fairies in an overgrown garden. The still-visible lions in Trafalgar seem to evoke Aslan, that mythical romantic lion from The Lion, The Witch and the Wardrobe. Maebh herself seems to have been named for Maeve, Queen of the Fairies. Frank Cottrell Boyce has tapped into a wonderfully child-like sense of wonder at the heart of London. Even Danny himself is not immune to the romance of the story, the fairytale influence. “I am curious. I am bewildered. I am – in fact – enchanted.” Indeed, this accounts for any vague issues with the pseudo-science of In the Forest of the Night. Trees do not work that way; solar flares do not work that way. Those watching primarily for science-fiction might find it strange that the only architectural damage in all of London was Nelson’s Pillar. However, it is perfectly in keeping with the mood of the story; this is not science-fiction, but children’s fantasy. While In the Forest of the Night struggles with the Doctor and Clara, it does a much better job with Danny Pink. Indeed, Danny seems to have stumbled upon the Twelfth Doctor’s central character conflict when he suggests that “one person is harder to understand, but more amazing, than universes.” The Twelfth Doctor is a character who has difficulty understanding people and how they relate to each other – although he does much better with the children here than you might expect. One of the more interesting conflicts within this season has been the contrast between Danny Pink and the Doctor. Listen positioned Danny Pink as the man that the Doctor might have been, a lonely kid in a home who signed on the army instead of joining the upper class. Danny and the Doctor have found themselves competing with each other for Clara’s attention and her affection. In the Forest of the Night plays up this contrast by casting Danny in the role traditionally reserved for the Doctor; the leader of a bunch of survivors. The script even acknowledges this. Danny Pink gets his own slant on the “wrong question” scene from Deep Breath. However, as one might expect, Danny’s suggested answer is a lot less fantastical than any proposed by the Doctor. “The question is, how did they get here?” Clara asks about the trees. Danny politely corrects her, “No, the question is, how are we going to get these kids home?” Clara concedes, “Oh, absolutely. Yeah. That is the big question.” Similarly, when Clara rings the Doctor, Danny points out she should probably be ringing parents or the school. Yes, that is an ad for Doctor Who on that bus. Why do you ask? There is a sense that Danny is a version of the Doctor who learned to accept the wonder in the everyday – the more mundane pleasures in life. How might the Doctor’s life have been different if he joined the army instead of going to the Academy and stealing a TARDIS? Danny seems to offer some small indication. It is a very nice arc, seeded rather cleverly through the season. It is astonishing how well the season builds towards Dark Water, even outside of the obvious teases involving Missy or the Nethersphere. There is an endearing optimism to In the Forest of the Night. Addressing the entire world, Maebh suggests, “Be less scared. Be more trusting.” It is a very sweet sentiment, particularly when coupled with the revelation that In the Forest of the Night is a story without any monsters; the freak occurrence at the heart of the story is not necessarily a bad thing. However, Kill the Moon made the same point much more effectively. Still, it is perhaps telling that the two most optimistic stories of the season are the most divisive. In the Forest of the Night is an episode packed with beautiful moments and imagery, but one that is undermined by very serious and fundamental flaws. It is an episode that flirts with brilliance and profundity, but leans too heavily on trite clichés. It’s the season’s biggest misfire, although not perhaps its biggest failure; it is an episode with more ambition and scale and enthusiasm than Time Heist or Robot of Sherwood, even if it builds itself around a highly questionable (and maybe even irresponsible) premise. In the Forest of the Night is an episode that comes perilously close to working, burning brightly but not long enough. I know that this is a series for children (that is broacast at night for some reason) but I’m beginning to get fatigued from all the children centred storylines. Thank God Courtney hasn’t reappeared (yet). I’m not a fan of Danny Pink so this episode was a slog to get through but I admit the visual sense was intriguing. Modern London is overused in the series but the forest covering the city was really a striking look. Ah, I didn’t hate Courtney so much. And I don’t mind the occasional child-centred hour here and there. I think it’s nice to get a little more variety in the type of companions. Now if only we could have one that wasn’t from modern-day London. The mental illness aspect irritated me, too. Speaking as someone with a mental illness, the only insight I’ve gained is that I vastly prefer the medicated me. Medicated me is happier, more productive and more pleasant to be around. Unmedicated me is sullen, withdrawn and mentally lethargic. There’s no contest really. After a good couple of episodes, this was indeed a pretty big misfire. I hope they learn from it. To be fair, I think the season has had a pretty good run overall. The only duds for me (to date) are Robot of Sherwood, Time Heist and In the Forest of the Night. And the first two are competent functional Doctor Who, while the latter is a curate’s egg of a story. I don’t think any would merit a “fail” grade on par with Fear Her or Evolution of the Daleks or Victory of the Daleks. I don’t think there’s been any story entirely without merit this year, even if not all of them worked as well as the Moon/Mummy/Flatline trifecta.